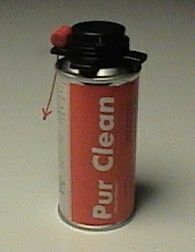 PRODUCT DESCRIPTION: Special cleaning solvent packaged in cannisters that fit the Foam Applying guns. Use this cleaner when tips or other parts need to be cleaned. This should be done just prior to storing the gun for extensive periods of time when it won't be used. The cleaner can also be handy when you need to remove some foam that has gotten somewhere unwanted.